Inspired by structures found in nature like bird and insect nests, the spherical floating lodges are made up of a bamboo and timber frame, and basket-like base. The base fits two guests comfortably, with two separate sleeping areas with sleeping bags and a central storage plank. If the guests are sleeping together, the area can be combined to make one large bed. A basket-woven wall extends upwards for two feet for privacy and protection. A mosquito net encases in the interior of the sphere, with a closure at the lodge’s entrance. Stretched over the upper parts of the floating orb is lightweight hydrophobic fabric sourced from Vietnam that protects occupants against rain. The lodges are kept in place with taut cables which are secured to neighboring trees, ensuring a minimal environmental footprint. The project would also include an elevated bamboo and timber observation deck, which is also suspended between three or four sturdy trees. The deck would allow guests to watch wildlife without disturbing their daily habits. If built, the project would look to local laborers to act as a catalyst for the local economy. 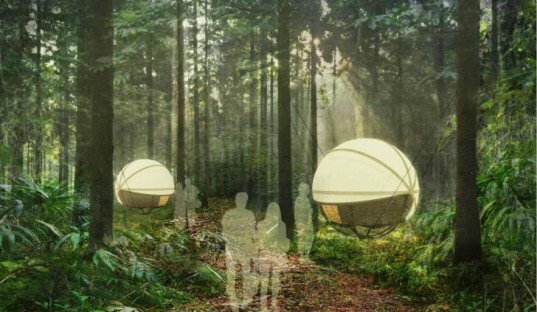 Inspired by structures found in nature like bird and insect nests, the spherical floating lodges are made up of a bamboo and timber frame, and basket-like base. The base fits two guests comfortably, with two separate sleeping areas with sleeping bags and a central storage plank. If the guests are sleeping together, the area can be combined to make one large bed. A basket-woven wall extends upwards for two feet for privacy and protection. A mosquito net encases in the interior of the sphere, with a closure at the lodge’s entrance. Stretched over the upper parts of the floating orb is a rain protecting fabric sourced from Vietnam, which has the additional benefit of being lightweight. The lodges are kept in place with taut cables which are secured to neighboring trees, ensuring a small environmental footprint. The project would also include an elevated bamboo and timber observation deck, which is also suspended between three or four sturdy trees. The deck would allow guests to watch wildlife without disturbing their daily habits. If built, the project would look to local laborers to act as a catalyst for the local economy.